Fresh produce is in abundance at Detwiler’s Farm Market in Palmetto. Detwiler’s Farm Market has built a reputation of providing fresh produce, meats, groceries, and other products at great prices in a fun and friendly environment. The family-owned and operated business has expanded their operations into Manatee County with the opening of a fourth store on July 18 at 1800 U.S. 301, in Palmetto. “We want to have people come for the experience,” said Sam Detwiler, president of the company and oldest son of the market’s founders, Natalie Grace and Henry Detwiler Sr.
“We want to give them a reason to get out of their homes and shop. When they come through the door we don’t know their situation,” Sam Detwiler said. “They could have had a bad day. “But when they leave with a smile, we know we impacted their life some way,” he said. It is that “customer first” business philosophy that helped make the three other Detwiler’s Farm Market locations so popular with shoppers. 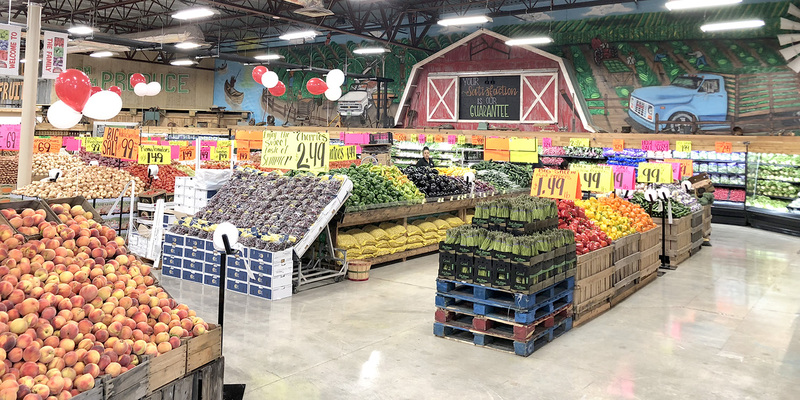 The first store was opened at 6000 Palmer Road in Sarasota about 10 years ago and was fashioned after a roadside produce stand with extras, such as fresh meats, groceries, baked goods, milk and eggs. In the ensuing years the family expanded and opened two more stores, first at 1250 U.S. 41 Bypass S., in Venice, and then 6100 N. Lockwood Ridge Road in Sarasota. When it became evident they needed to expand again, they looked north. 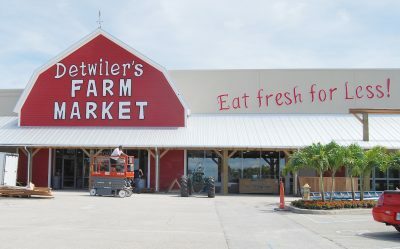 “We needed a bigger store and found this building,” said the family patriarch, Henry Detwiler Sr.
A worker makes some final touchups to the front of the newly opened Detwiler Farm Market at 1800 U.S. 301, Palmetto. The building was a former Winn Dixie that has been vacant for several years. The family has always worked together to make their entrepreneurial endeavors a success. Henry Detwiler Sr., who also is a pastor at the Hope Fellowship Mennonite Church, grew up in the butcher business. He met and married his wife, Natalie Grace, and they started raising a large family. They had nine children ­— five girls and four boys. The family started working for Sutter’s Egg Farm on Richardson Road in the early 2000s. They would grade and clean the eggs, which were sold on the honor system at a roadside stand. Because Henry had that retail sales experience as a teenager in Pennsylvania, he suggested selling produce at the roadside stand. That stand became very popular and after a year they moved it to Fruitville Road and called it Fruitville Grove Market. After seven years they lost their lease, but within three months they found another place at 6000 Palmer and opened Detwiler’s Farm Market in September 2009. “We worked our tails off to get it started,” said Sam. Sam Detwiler, president of Detwiler Farm Market, stands with his father, Henry Detwiler Sr., in front of a mural of the first roadside stand the family owned on Fruitville Road in Sarasota. 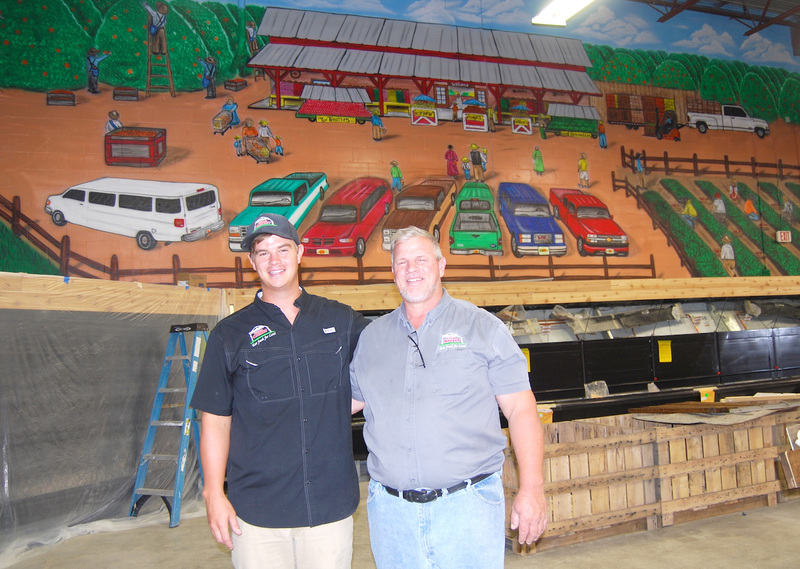 The mural is on the front wall of the newest Detwiler Farm Market at 1800 U.S. 301, Palmetto, which opened July 18. Their mother developed health problems, and that pushed the boys to quit school, said Sam, who was in the seventh grade at the time, to help run the store and take care of their mother. He said none of his brothers and sisters went to college, yet they are all successful. 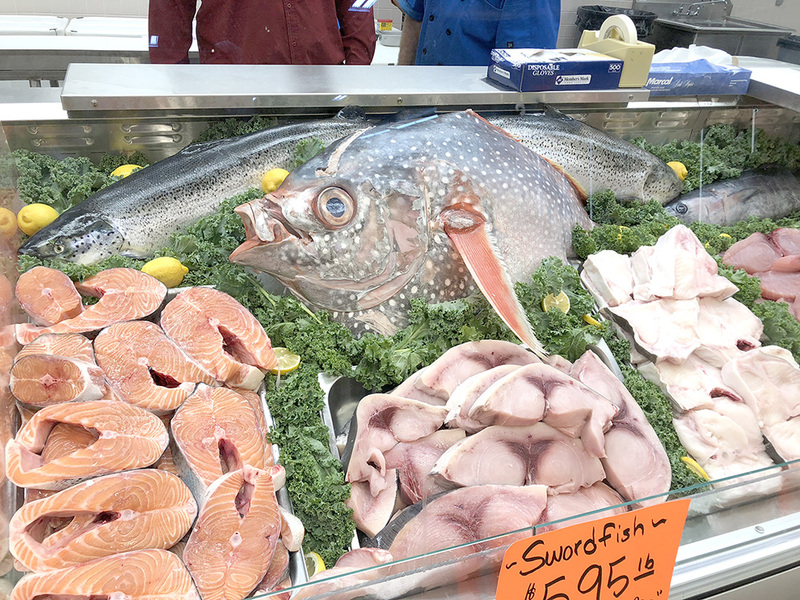 The seafood market is a popular area with fresh fish and seafood at reasonable prices. He uses this philosophy to manage the expansion of the family business. The size of each store grew with the opening of the new locations over the years. The original store on Palmer was only around 5,000 square feet and the Venice store was 11,000 square feet. “We decided we had to move north and opened the University store in February 2015 to take the pressure off of Palmer,” Sam said. 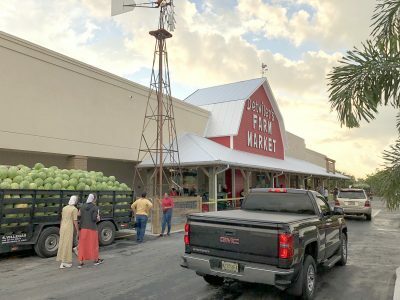 The 25,000-square-foot store on the corner of Lockwood Ridge Road and University Parkway became a very popular location, drawing more shoppers from Manatee County. “We kept an eye out for another location and found Palmetto,” Sam said. This was the first building they purchased and at 50,000 square feet it was double the store on Lockwood Ridge Road. The extra space allowed them to expand all the departments and create a more open shopping experience. Sam will buy a truckload of produce and pass on the savings with low prices, he said. The larger size of the store interior allows distinct architectural features, such as a roadside produce stand, a seafood market, and a meat counter that looks like a giant butcher block. The larger baking facility at the Palmetto store will be providing baked goods for the other locations, he said. The newest Detwiler’s Farm Market in Palmetto is the fourth and largest of the family’s stores. The other three markets are in Sarasota. He said the employees helped make Detwiler’s Farm Market a success. The employees are always smiling and doing things to make the customers happy, such as interacting with the shoppers, walking around the store using bullhorns to announce specials, or bantering with each other in a jovial way at the fish market and other departments. “We want to do more as we grow. Shopping should be fun and not a chore. For more information about Detwiler’s Farm Market, visit www.detwilermarket.com, or on Facebook at www.facebook.com/DetwilersMarket.